Building a house is hard work. A decade ago my mum and I built an eco-house together. We loved it—the freedom of designing what spaces we wanted, the excitement of choosing only materials we wanted to use, and most of all the pure joy of moving into the finished house. I have lived in many places but up until then I had never realised that a house could actually make me happy. Sitting on a reclaimed-wooden floor warmed by the sun streaming in through a draught-free window, knowing my water was being heated, and electricity generated, for free by the sun, I felt a surge of happiness. I also suffered from a wave of exhaustion, a realisation that there was no money left, a worry about all the jobs still to do, and a fear about whether the house would stay standing, endure a storm, and if the systems (like the rainwater harvester) would carry on working. But it was at this moment, despite the work, stress, and worry, that I fell in love with eco-building and its possibilities. I also realised how terrible most of the other houses I had lived in had been. They were cold, damp, draughty, dark, and even mouldy. Since then I have been exploring how we can build better houses that are affordable, comfortable, and ecological. Karen Liftinii calls this the “architectures of intimacy” where buildings in communities are purposefully designed to encourage social interaction. When designing and building using circles—as a house shape, as houses around a communal circular garden, as an arrangement for seating—the circle is used to avoid hierarchy and enables everyone to see each other. Building houses together is also a way to build community. Using materials such as strawbale which require little specialised training means anyone can get involved. Yet building collectively and in community is not always easy. Eco-communities benefit from a shared work force, shared infrastructure costs, and economies of scale, and builders benefit from mutual support and a niche space in which to innovate and take risks. However, the costs of building in eco-communities tend to be the time required to make decisions and an experimentalism that can mean ignoring established building approaches or building physics. It is easier and cheaper to build eco-homes in communities, but the results are more variable. Building in a community requires effort to be focused into communal systems of decision-making, living together, and processes of sharing. Numerous social and economic benefits result from this, but the houses themselves can suffer. In some cases eco-communities offer important space for periods of innovative and creative experimentation that go on to influence eco-home design elsewhere. But those who seek to focus on housing can be accused of specialisation or elitism, and be marginalised. Building together is cheaper than building alone. Numerous strategies can reduce the costs of construction; building smaller houses, using cheap marginal land, using reclaimed materials, or reducing labour costs through self-build. Eco-communities use all these tactics and some have managed to build incredibly inexpensive homes. For example, Tony Wrench built his roundhouse at Birthdr Mawr (Wales) for a total cost of $4,000. However, eco-communities are also able to benefit from their size to reduce the costs of building by sharing infrastructure and devising cost-sharing schemes. LILAC (Leeds, England) developed a new home ownership model to ensure the houses remained affordable. Residents only pay a housing charge of 35 percent of their income. In effect the higher earners subsidise those on lower incomes. In Panya Project (Thailand), large communal spaces include the shared kitchen, gardens, sitting area, office space, laundry, workshops, greenhouses, guest space, and bathrooms. Panya Project is near Mae Taeng, Chiang Mai, northern Thailand. Established in 2004, the 10-acre site has become a place for experimentation and education in permaculture and natural building. 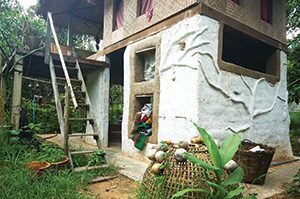 Built using either sun-dried adobe bricks or wattle and cob, homes are purposely small—one house is just three metres by four and a half metres floor space, because it contains only space for sleeping and privacy. Most simply contain a bed and some storage space. All cooking, dining, and washing occur in communal spaces. This reduces both build time and material requirements. Even in cities, eco-communities often offer small personal spaces compensated for by large communal areas. At Los Angeles Eco-Village, an eco-retrofit of an old brick apartment block in downtown L.A., residents rent private apartments with individual kitchens and bathrooms, but they share the gardens, bike storage room, bulk food storage, meeting space, and a large entrance seating area. Despite the compact size, the physical and emotional sense of home extends far beyond the house. Peninsula Park Commons, initiated by Eli Spevak and Jim Labbe in 2003, is a cohousing development created by renovating six existing houses and building four new structures. Beyond the buildings lie the communal gardens and raised vegetable patches. Rather than stop the development at the edge of the plot, however, Peninsula Park Commons stretched out into the street and reclaimed the sidewalk with planters. Plant beds overflow and merge the communal garden with the public space. This is a very deliberate approach; in Eli Spevak’s words, “we want to slip into existing communities.” They hold community events like their annual community ice cream social and garden party to reach out and draw people in. Lydia Doleman, a self-builder, argues that “buildings have the capacity to equalize people or segregate them.”iv Eco-communities need to design their buildings and shared spaces to accommodate diversity. While communities have developed new forms of interpersonal relationships, often rejecting the notion of a nuclear family, other forms of diversity have been paid less attention, especially race, disability, and class. Camphill communities seek to provide places for disabled people to live and work, and new cohousing communities are being designed for seniors, but in most eco-communities little provision is made for differently abled bodies. Finally, Jonathan Dawson argues it is time for eco-communities to start to accept the need for professional support: “as planning regulations have tightened, it has become more difficult for groups to create substantial new settlements without professional assistance.”v Eco-communities are generally quite poor at collaborating with professionals. While many examples of outstanding, high quality eco-building exist in eco-communities, in many other examples little reference was made to existing building knowledge, resulting in simple mistakes. Communities can fall prey to anti-professionalism, a rejection of the importance of experts, specialists, or building professionals such as architects and engineers. The journey of Twin Oaks (Louisa, Virginia) exemplifies the tension between unskilled building and a professional approach. The community had the input of professional architects and builders who had given up their jobs and settled there. Over time some of these builders began to get frustrated with the need to work with volunteers and constantly teach others, and eventually a key builder departed. At Dancing Rabbit (Rutledge, Missouri), Alex Whitcroft, a trained architect, sought to overcome this tension by being a “brave specialist,” someone who lived on site and worked with residents: “what is needed is not specialists but…brave specialists who can listen, ask the right questions, and design with communities while integrating their expertise.”vi This compromise approach is perhaps the most productive way forwards in terms of ensuring quality eco-buildings. Sharing space, objects, equipment, and skills reduces costs and environmental waste, but robust systems of sharing with clear agreements are needed. Living in compact spaces works if there is communal space available to share, particularly access to green spaces. Without explicit effort to encourage diverse types of residents and self-builders, eco-building will likely remain the preserve of the white middle classes. Although learning by doing is useful, the need to learn from the past, from experts and professionals, and to seek out existing knowledge is too often ignored, wasting time, effort, and resources. That many eco-communities relied upon volunteers to build (and maintain) their houses has unintended costs. Sometimes this results in inefficient building practices, incomplete projects, failure to consider and plan for maintenance, and poor quality buildings. Eco-communities’ focus on social issues, on commitment, building community, and collective governance, has sometimes led to neglect of the need to learn and understand the physics of how buildings work. Building by anticipating future change in occupiers, and thinking through how to, for example, maintain affordability, are essential to the success of eco-homes. Jenny Pickerill is a Professor of Environmental Geography at the University of Sheffield, England. She has worked with many eco-communities worldwide and recently published a book, Eco-Homes: People, Place and Politics (Zed Books). Information about her work and contact details are at www.jennypickerill.info.  Bang, J M (2005) Ecovillages: A Practical Guide to Sustainable Communities. Floris Books, Edinburgh, pp.124-125.  Litfin, K T (2014) Ecovillages: Lessons for Sustainable Community. Polity Press, Cambridge.  Christian, D L (2003) Creating a Life Together: Practical Tools to Grow Ecovillages and Intentional Communities. New Society Publishers, Gabriola Island, Canada, p.165.  Dawson, J (2006) Ecovillages: New Frontiers for Sustainability. Schumacher Briefings, Green Books, Totnes, Devon, p. 82.  Whitcroft, A (2012) Getting Ecovillages Noticed, Communities, #156, Fall 2012, pp. 29-33 (p.30).